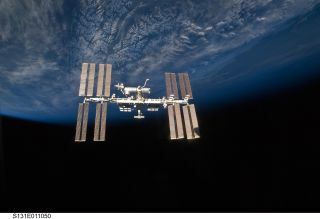 The International Space Station as seen in a photo taken in 2010. A Russian official claims that samples collected by cosmonauts show evidence of sea plankton on the outside of the International Space Station, news agencies are reporting. Cosmonauts on the orbiting outpost have allegedly discovered trace amounts of sea plankton and other microscopic organisms living on the outside of the station, exposed to the vacuum of space, according to a news story quoting space station official Vladimir Solovyov. The unconfirmed claims — reported by ITAR-TASS — were reportedly the result of a long-term study done using specialized equipment by Russians on the station, according to the news agency. Although the cosmonauts did sample the outside of the space station and a window on one of the modules this week, they were not necessarily looking for traces of microbes, according to NASA. "I'm not sure where all the sea-plankton talk is coming from," Huot told Space.com. "The Russians did take samples from one of the windows on the Russian segment, and what they're actually looking for is residues that can build up on the visually sensitive elements, like windows, as well as just the hull of the ship itself that will build up whenever they do thruster firings for things like re-boosts. That's what they were taking samples for. I don't know where all the sea plankton talk is coming from." It's possible that the plankton, if confirmed, could be a contaminant launched into space with the space station module, said NASA scientist Lynn Rothschild. For example, tardigrades — a microscopic invertebrate found all over the world — can dehydrate and fall into a hibernation that allows them to survive in space, Rothschild said. Tardigrades (also called "water bears") are part of a group classified as "extremophiles" — organisms that can survive in even the harshest environments. "Note that there is a long history of U.S. and European missions proving that microbes could survive in low Earth orbit for extended periods of time," Rothschild told Space.com via email. Researchers have also discovered microbes in Earth's upper atmosphere. In 2013, scientists reported that they found a large number of many kinds of microorganisms in the atmosphere 5 to 10 miles (8 to 16 kilometers) above the planet's surface, according to Space.com sister site Live Science. Bacterial life has even been found 24.8 miles (40 km) up into the atmosphere, according to a 2013 interview with Tina Santl Temkiv, an environmental chemist at Aarhus University in Denmark, by Space.com's sister site Live Science. NASA officials keep an eye on bacteria growing inside spacecraft. Biofilms — colonies of bacteria — grow on the interior of the International Space Station, and scientists are working to understand how the microgravity environment affects their growth. Astronauts grew bacteria in fake urine during a flight of NASA's space shuttle Atlantis and found that it grows strangely when compared to biofilms of the same species cultivated on Earth. "The unique appearance and structure of the P. aeruginosa biofilms formed in microgravity suggests that nature is capable of adapting to nonterrestrial environments in ways that deserve further studies, including studies exploring long-term growth and adaptation to a low-gravity environment," Cynthia Collins, who led the study, said in a 2013 NASA statement. "Before we start sending astronauts to Mars or embarking on other long-term spaceflight missions, we need to be as certain as possible that we have eliminated or significantly reduced the risk that biofilms pose to the human crew and their equipment."